Discover how some of the world’s most original artists, writers and musicians structured their day. 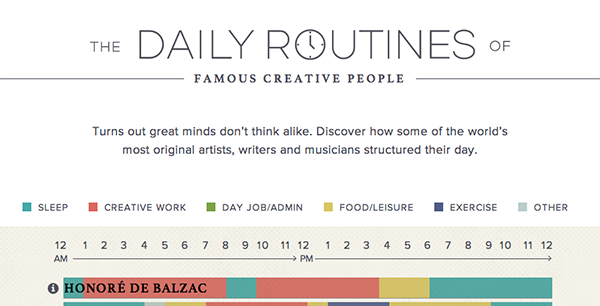 Have you always been curious about the daily routine of a creative person you admire? This interactive graphic from Podio details the daily drills of some well-known creative people from Ludwig Van Beethoven and Wolfgang Amadeus Mozart to Maya Angelou and Haruki Murakami. The graphic details the 24-hour routine of these artists, writers, and musicians such as sleep, creative work, day job/admin, food/leisure, exercise, and other daily habits. If you’re not familiar with someone in the list, you can hover over the info icon next to their names and a short information will pop-up about them. You can also filter out each category by toggling on and off, and hover over each bar to read specifics about the daily routines. We embedded three snapshots of the guide below and highlighted the sleeping and work routines. Check the interactive version of the graphic over at Podio. As you may have noticed, each creative person in the list made sure to get a decent amount of sleep despite of their varying schedules. Turns out great minds don’t think alike.